$30.00 includes shipping and handling. Email: marc@magicmarcproductions.com to purchase a copy while supplies last. Billy's second solo album "Travelin'" was recorded at ASI/Audiotek in Minneapolis. David Rivkin was the engineer. This time around, Billy recorded nine country/folk songs, over five to seven sessions in 1975. Among the 12 local musicians who played on the album with Billy was Rick LiaBraaten on drums. In addition to producing the album, Al Heigl also played guitar and slide guitar on some of the songs. The album was mixed in quadrophonic sound by Paul Martinson at Sound 80. In 1976, "Travelin'" was released on the Mill City label. The concept of "Travelin'" originated from Billy's midwest road trip with Doug Ackerman from Lieberman Enterprises to promote his first solo album. Like his first album, "Travelin'" was also played on KQRS. "While promoting Persephone, I met Al Heigl of Mill City Records. He signed me to his label and produced my follow up "Travelin'. 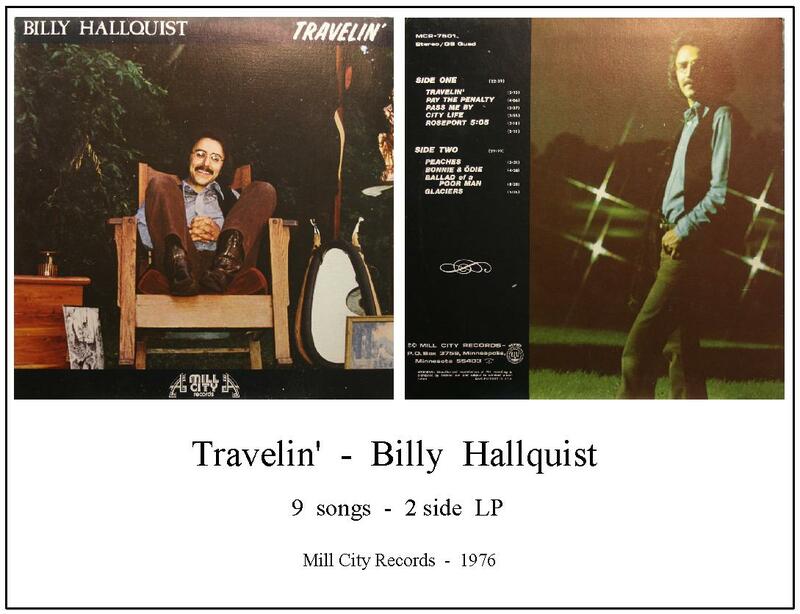 Travelin' started as a joint project with fellow Mill City artist Kevin Odegard (The Hallquist/Odegard Band). It got sidetracked when Kevin was given the opportunity to play along with other local musicians (Chris Weber, Gregg Inhofer, Peter Ostroushko, Billy Peterson and Bill Berg) on Bob Dylan's "Blood On The Tracks" sessions at Sound 80 where I recorded Persephone and mixed Travelin'. Kevin parleyed his notoriety into an album deal at a larger label. I included one of his songs on Travelin' and contributed some session work to his album too." Pick Six: RIP, Billy Hallquist.